The innovative systems in Green Roof 4.0 from ZinCo have the potential to revolutionise the use of roofs, with regard to water retention, evaporation and biodiversity. The "Stormwater Management Roof" specifically stores large quantities of water on the roof, allowing it to run off into the sewer system in a time delay, to prevent the threat of flooding. 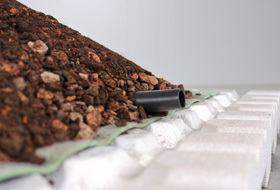 Both the "Urban Climate Roof" and the "Irrigated Extensive Green Roof" live from the concept of underfloor irrigation: Water in the dripperlines is distributed in the Aquafleece AF 300 and is available to the plants directly in the root area thanks to capillary action. A green roof means "protecting the building structure", "ecological balance" and also frequently "architectural highlight". Against this backdrop, the green roof has been further developed over the decades with regard to all possible aspects of extensive and intensive green roofs. Completely new dimensions are being added in these times of climate change, hence the term Green Roof 4.0. The innovative ZinCo systems are called "Stormwater Management Roof", "Urban Climate Roof", "Irrigated Extensive Green Roof" and "Biodiversity Green Roof". They all have revolutionary potential, which is the power to introduce sustainable structural change in the area of green roofing. Climate change and progressive urbanisation and land sealing are creating ever greater problems in conurbations: an increase in severe rain events resulting in flooding, ever longer drought periods, overheating and excessive fine particulate levels. This is forcing us to rethink our approach. How should we deal with severe rain events? 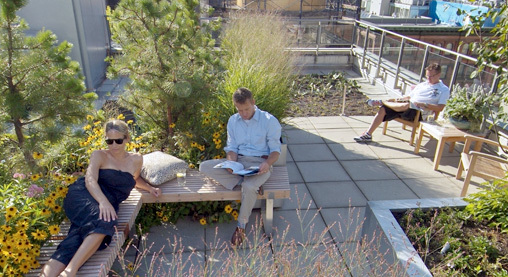 A green roof stores stormwater and allows it to run off in a time delay or to evaporate. Normal extensive green roofs store between 20 and 40 l/m² water and intensive green roofs between 50 and 100 l/m². The new "Stormwater Management Roof" from ZinCo specifically multiplies this retention effect, while at the same time effectively balancing precipitation peaks. This takes the pressure off the sewer system and reduces the risk of flooding. 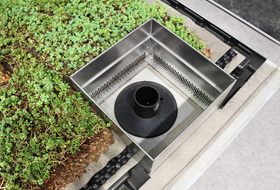 The newly developed Floradrain® FD 60 neo is used as a spacer beneath the actual green roof build-up. It provides for the storage of almost 60 l/m² of water, in addition to the quantity, mentioned above, in the actual green roof build-up. During a pre-defined period (between 24 hours and a number of days), the water slowly flows through a throttle element and into the sewer system. Meanwhile, the green roof build-up located over the spacer ensures that the elements are present that are vital for the proper functioning of the green roof, for example, air-water household in the root area, drainage and water storage for the plants. This allows for the creation of all types of green roof for all types of application including walkways and driveways. How should we deal with overheating? Increasing land sealing also has the effect of inner cities heating up considerably as a result of thermal radiation. This is referred to as the "urban heat island effect". The "Urban Climate Roof" is designed for maximum evaporation capacity which actively contributes to urban climate control, especially during dry, hot periods. In order to do this, water, and from an ecological point of view, preferably grey water, has to be available continuously for the plants. The plant community "Urban Climate Roof" has been specially developed for this application as part of a DBU research project at the University of Weihenstephan. The core element is the new, double-layer Aquafleece AF 300 that is automatically irrigated by means of dripperlines in combination, for example, with Floraset® FS 50. The underside of the thick fabric of the Aquafleece first of all distributes water on the surface and only lets the water drip through once the upper side of the fleece is totally saturated. The water reaches the overlying substrate through the capillaries and is actively evaporated by the plants. As a comparison: A mature urban tree with a crown of about 100 m² surface evaporates about 300–500 l/day. A 100 m² large "Urban Climate Roof" evaporates 700–1000 l/day, approximately double the amount. Moreover, 300 l/day is sufficient to cool the air volume of a 100 m ×100 m × 100 m cube by about 3–5 °C, depending on current humidity. The perceived cooling effect in individual street gorges is, naturally, impacted by factors such as the height of the buildings and the direction and speed of the wind. Generally speaking, increased evaporation will always ensure greater cooling capacity in urban centres. How should we deal with long periods of drought? Due to climate change, more and more regions in Germany are also faced with periods of drought that are longer than in the past. This includes, for example, the Mainz Basin and the entire north-eastern area around Erfurt, through Magdeburg and Berlin, up as far as Usedom. The annual average precipitation there is at times considerably below 500 mm. 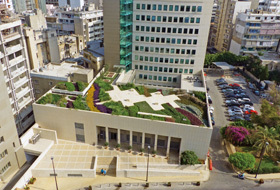 Cost-effective irrigation is also required in the case of extensive green roofs. The vital component in the "Irrigated Extensive Green Roof" is the Aquafleece AF 300 that is irrigated using dripperlines that are automatically regulated in the event that there is no natural precipitation. The distribution and supply of water through capillaries to the substrate ensures that the water is available directly in the root area. Therefore, water consumption is reduced considerably, unlike a conventional additional irrigation from above where the water evaporates at the surface. Perfect for dry climates, both here and in regions around the Mediterranean. This flexible system is suitable for roofs with a pitch of between 0° and about 5°. How do we facilitate biodiversity? 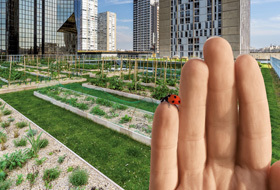 In addition to the new systems relating to climate change, the "Biodiversity Green Roof" expands the range of roofs within Green Roof 4.0; the reason is that the conservation of the biological diversity of fauna and flora is a key life force for mankind. 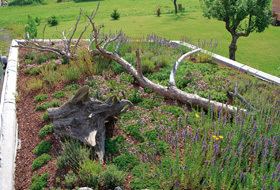 The "Biodiversity Green Roof" is characterised by its special biodiversity modules that increase the biotope function. This includes designing the substrate surface with individual mounds containing a substrate that is rich in topsoil and nutrients and by choosing forage plants specifically for insects and birds. In addition, structural elements such as dead branches and tree trunks, vegetation-free areas such as sand pockets and coarse gravel beds and temporary water bodies are considered to be an important enrichment. Nesting aids such as insect hotels, bumble bee boxes and ant stones are very helpful. Over time, therefore, a particularly biodiverse and ecologically invaluable habitat will develop on the roof. Even existing greened areas that are species-poor can be converted at any time to a "Biodiversity Green Roof" using these modules. Given the new dimensions described above in terms of retention, irrigation, evaporation and biodiversity, green roofs are fundamentally capable of far more than has been the case to date. Whether the project is a new build or restoration, it always involves a roof, and Green Roof 4.0 will ensure that the use of roofs will be revolutionised.